The company is becoming Consolidated Communications, with plans for faster internet service in Maine, New Hampshire and Vermont. The company that bought FairPoint Communications is discarding the old name and making plans to upgrade the service of tens of thousands of customers in northern New England. 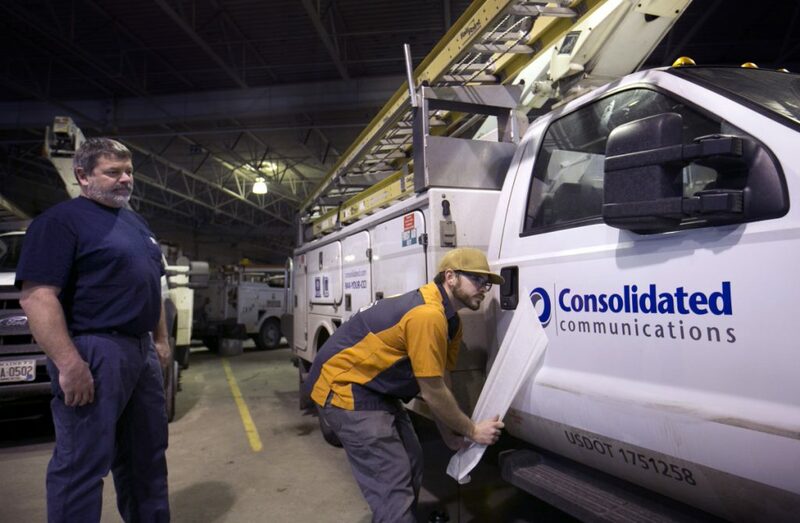 Consolidated Communications, which has operations in 24 states, is rebranding trucks and buildings with its own logo in the early months of this year, providing the most visible change for its customers in Maine, New Hampshire and Vermont since it bought FairPoint last summer. The Mattoon, Illinois-based company has been making changes behind the scenes since closing on the $1.5 billion deal: It has eliminated state president positions in Maine, New Hampshire and Vermont in favor of the new company’s regionalized structure and has been quietly preparing to roll out higher-speed internet offerings. The new team will be negotiating its first contract with workers in the coming year. Consumers have been pining for faster internet offerings in a rural region where internet access and data speeds have lagged behind more populated places. The goal is to upgrade service for existing subscriber locations to enable faster speeds; there are no price increases planned for existing customers, said spokeswoman Angelynne Amores. Michael Charter, a FairPoint customer in Jericho, Vermont, lives just outside the state’s largest city, Burlington, where there is a multitude of internet service providers. But his only option for a provider is FairPoint. And it is so slow, he said, that he has purchased two service lines to try to keep the family’s online television, internet use and work from choking for lack of bandwidth. Some of his televisions and computers are on one high-speed modem and router; other equipment is linked to another modem and router. He welcomes the idea of faster speeds. “I love the sound of that,” he said. FairPoint’s acquisition of Verizon’s landline assets in northern New England was fraught with problems. FairPoint struggled with debt, declining landline accounts and customer service issues before filing for bankruptcy, from which it emerged in 2011. The company also weathered two worker strikes. But FairPoint left behind an extensive fiber network in the three-state region that will provide the backbone for the improvements Consolidated wants to make. With the acquisition, Consolidated is one of the nation’s Top 10 telecommunications companies when it comes to fiber used for high-speed data, Koester said. The key to the company’s growth is using the fiber to boost speeds, and the goal is to increase speeds for 300,000 customers in the coming year, he said. That represents about 30 percent of homes in the company’s three-state territory in Maine, New Hampshire and Vermont. Analysts are looking favorably on the merger but note it will take time to realize full benefits.